Gallia Academy senior Lane Pullins, right, maintains leverage on an opponent during a 182-pound contest at the 2018 Skyline Bowling Invitational held Dec. 29, 2018, at Gallia Academy High School in Centenary, Ohio. CENTENARY, Ohio — The Gallia Academy wrestling team scored a pair of wins over visiting South Gallia and Zane Trace on Wednesday night during a non-conference tri-match at GAHS in Gallia County. 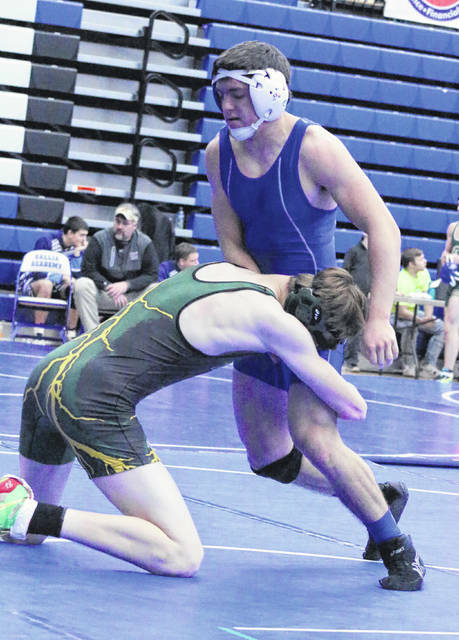 The host Blue Devils earned two decisive victories after posting a 54-12 decision over South Gallia before claiming a 51-24 victory over the Pioneers in the night cap. GAHS collectively went 8-4 overall in head-to-head bouts and also benefited from 10 forfeits in the two matches. Conversely, the opposition won two matches by forfeit, and there were also a quartet of double forfeits. Lane Pullins (182) and Logan Griffith (220) accounted for half of Gallia Academy’s head-to-head victories, with each grappler coming away with two pinfall wins apiece. Garytt Schwall (106), Kenton Ramsey (113), Jason Stroud (120) and Johnathan Shepard (285) also went 2-0 apiece, with each grappler earning one forfeit decision. Schwall, Ramsey and Shepard also claimed a pinfall win each, while Stroud earned a 12-7 decision against ZTHS. Dakota McCoy (138), Melvin Valentine (145), Bronson Carter (152), Charles Mullins (160) and Shane Stroud (170) also claimed a win each for the hosts via forfeit. Justin Butler (160) and Chad Bostic (170) came away with Rebels lone victories against Gallia Academy, both of which came by pinfall. Jordan Hoselton (138) and Alec Brown (145) each scored a pinfall win for Zane Trace against the Blue Devils. The results of the Zane Trace-South Gallia head-to-head match were not made available by press time.